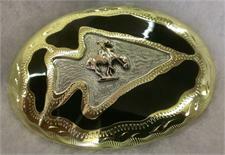 Silver Hills Trading carries a variety of belt buckles including western belt buckles, Indian belt buckles and southwestern belt buckles. Belt buckle metals include sterling silver, gold, brass and nickle. Stone varities include turquoise, black onyx, coral and cultured pearl. 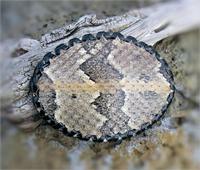 These buckles make excellent gifts for that special someone in your life and are suitable to be worn for all occasions. *Items can be ordered from the pictures depicted. Items shipped may not be exactly the same as in the picture. Prices vary with type of stone or shell, gauge of silver, quality of stone or shell and artist making the item. Some items come in a wide variety of stone or shell; Turquoise, Coral, Lapis, Black Onyx, Pink Mussel Shell, Malachite and Cultured Opal, to name just a few. Some items will be natural stone and shell or stabilized stone or shell or block stone or shell. 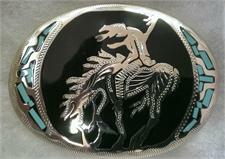 Southwestern belt buckle features native american indian and his horse at rest on black background. Nickel silver with Turquoise accents. 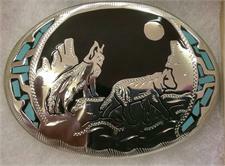 Wolves howl at the moon on this southwest buckle with black background. Design in nickel silver with turquoise accents. Eagle head is silhouetted on a black background with a framework of nickel silver and turquoise on the sides. 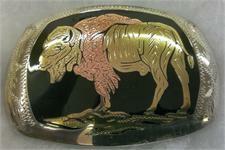 Buffalo belt buckle features a highly detailed bison silhouetted on black background. Buckle is made of Nickel Silver, Brass and Copper. Fits 1 1/2" belt. Desert Bighorn Sheep Ram belt buckle features a highly detailed ram head silhouetted on black background. Buckle is made of Nickel Silver, Brass and Copper. Fits 1 1/2" belt. Double Eagle features Bald Eagle in flight and head silhouette with fine detail. Buckle is made of Nickel Silver, Brass and Copper. Fits 1 1/2" belt. Eagle Head Buckle made of Nickel Silver, Brass and Copper. Made in Colorado. Fits 1 1/2" belt. 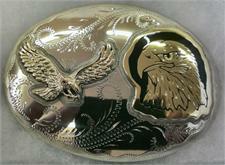 Eagle in Flight belt buckle is made of Nickel Silver, Brass and Copper. Featuring an eagle gliding on a black background. Fits 1 1/2" belt. Oval buckle with design within design. Arrowhead with indain and pony at rest. Buckle is made of Nickel Silver, Brass and Copper. Fits 1 1/2" belt. 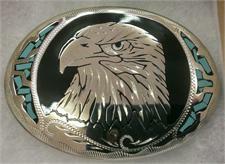 Native American belt buckle is made of Nickel Silver, Brass and Copper. 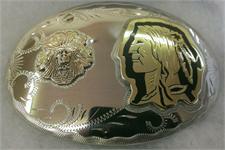 Indian chief and noble warrior head are carved into buckle. Fits 1 1/2" belt.